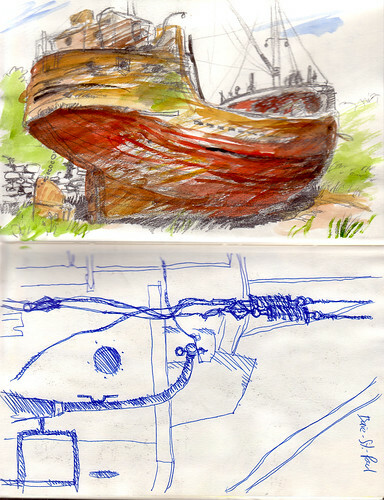 Sketchbook, Baie-St-Paul 1998, originally uploaded by Brin d’Acier. After a while routines started to settle, and I drew less and less of my everyday surroundings. Just as people normally don’t snap hundreds of photos on their way to work, but photograph everything they see when on holiday, my sketchbooks became synonymous with travel journals. 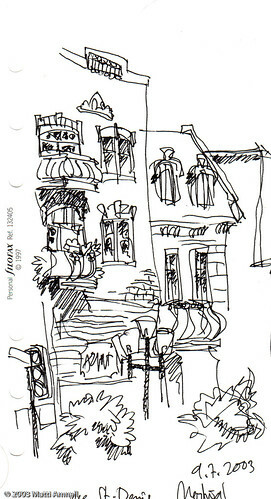 Filofax 2003 Montréal, originally uploaded by Brin d’Acier. When on holiday, I drew on everything at hand, including my Filofax. Japan 2006 Page from travel journal-21, originally uploaded by Brin d’Acier. 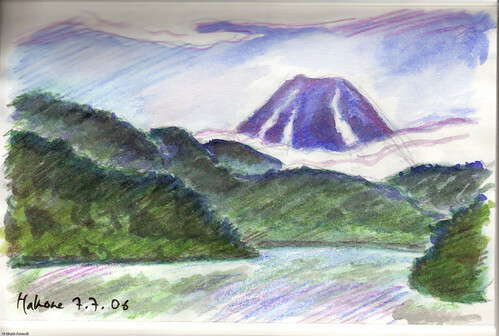 Hakone – Lake Ashi and Mt Fuji. After three days of waiting in the mist, suddenly the clouds parted in the morning. The hotel’s room service menu included the following item: Watercolor kit so you can paint your own views of Mt. Fuji. I found the idea of ordering painting supplies from room service great I had to do it. The kit proved to be as good as their breakfasts. We still have the waterbrush that came with it. 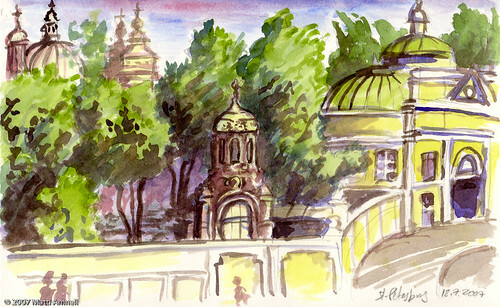 Sketchbook_St-Petersburg_2007_001, originally uploaded by Brin d’Acier.